Every culture tells stories of strange beasts that haunt the edges of civilization. Seldom corroborated, the accounts of those who have encountered such creatures are brushed aside, or at best turned into colourful local legends. But always lurking beneath such myths are more than a few shreds of doubt - for what if the stories were true? Mystery Monsters Revisited presents 10 elusive creatures inspired by real-world folklore. Each monster entry investigates the types of evidence the cryptid leaves in its wake, the creature's bizarre and secretive ecology, eyewitness accounts of the beast and its strange powers, advice on how to integrate it into your game, how the monster fits into the world of Golarion, and more. Death worms, acid-spitting desert dwellers whose fatal poison and beams of electricity spell the end for unwary travellers. Mokele-mbembe, long-necked saurians forgotten by time. Mothmen, unfathomable agents of destiny that presage catastrophic events. The Sandpoint Devil, a fire-breathing equine terror that ravages the hinterlands of its namesake community. Water orms, whose myriad forms have spawned countless legends near the lakes they inhabit. Yetis, misunderstood natives of mountain peaks whose violent urges can be traced back to fell, otherworldly energies. Other enigmatic creatures like the towering sasquatch, destructive sea serpent, and of course, the notorious, blood-sucking chupacabra! 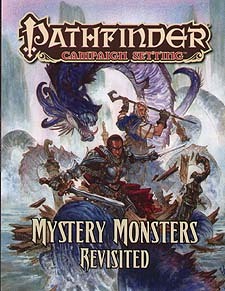 Mystery Monsters Revisited is intended for use with the Pathfinder Roleplaying Game and Pathfinder campaign setting, but can easily be used in any fantasy game setting.